What is Private WHOIS or Domain Privacy? Prior to May 25th 2018, all gTLD domain name registrations (which include .com, .net, .info, .biz etc) had their details available publicly via a WHOIS lookup. As per the ICANN terms, when registering a domain a user is required to include details such as name, address, email, phone number, and administrative and technical contacts. This information is often referred to as "WHOIS data" and was available to the public via a WHOIS lookup. 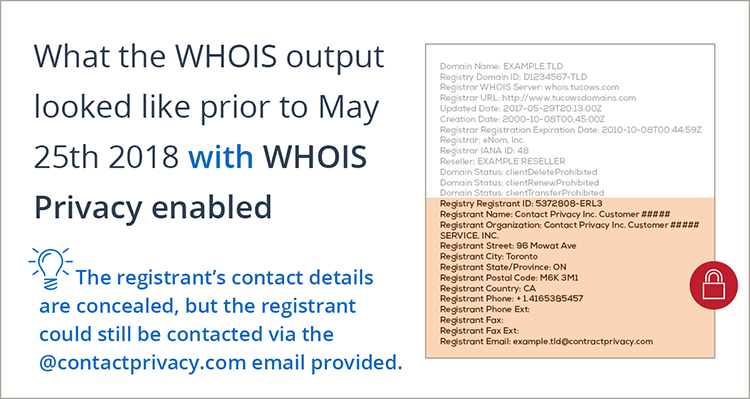 Read more about "What is WHOIS" on the ICANN website. 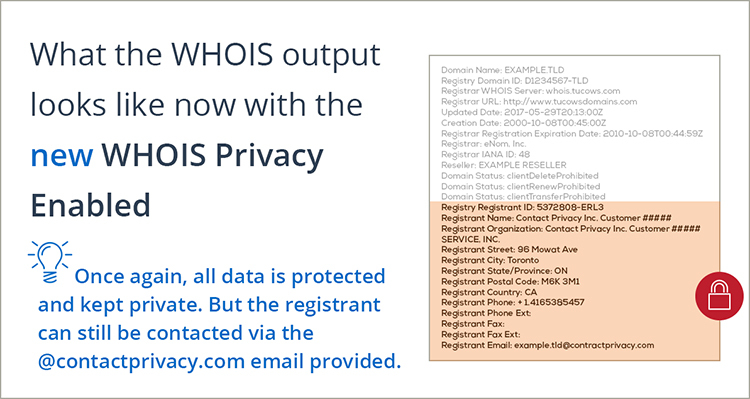 Due to personal details being available via a WHOIS lookup, many domain registrars offered a Private WHOIS or Domain Privacy service. This service was charged at a fee and would allow users to hide their personal details that would appear in a public WHOIS lookup. This service was only available for gTLD domains, such as .com etc. It isn't available for .com.au domains (see more at the following link from the AUDA website - "Private registration services for .au domain names"). 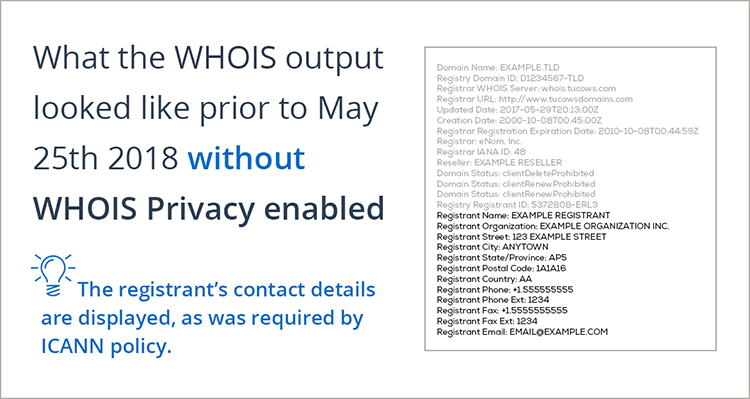 As of May 25th 2018, the WHOIS data available to the public has now been restricted and made private. This means that personal details are hidden from public view, much like what the previous Private WHOIS service enabled. These changes came about due to the GDPR (General Data Protection Regulation) which sought to protect consumers rights to privacy. What do these changes mean for the Private WHOIS service? 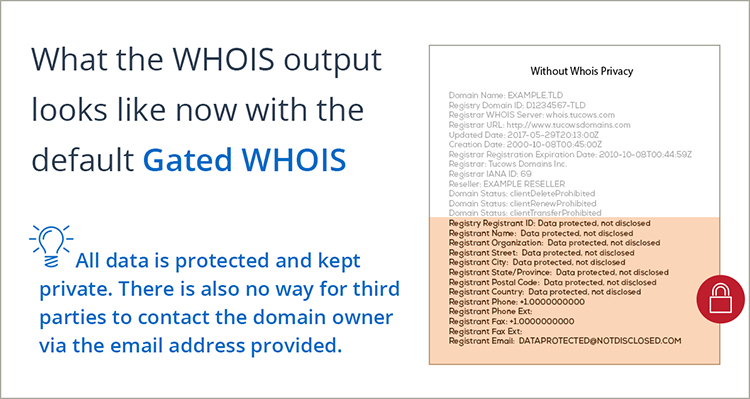 The default WHOIS details for gTLD domains that are available via a public WHOIS are now private and do not disclose any of the customer's personal details. This is known as a "Gated WHOIS". This means that the previous paid Private WHOIS service is no longer needed for customers who enabled it in order to protect their private details. However this service will also keep the WHOIS data private from those that have access to the Gated WHOIS service. The general public cannot access the Gated WHOIS. Customers who have a gTLD domain name registration with StudioCoast, have a Gated WHOIS meaning all their details are private from a public WHOIS lookup. This means that the previous Private WHOIS service is being disabled. Customers who still interested in having this service enabled, can raise a support request via hostControl.